We accept payment using major credit cards such as VISA and MASTER. Nonetheless, payment clearance may take a couple of days while you need to have your visa approved as quickly as possible. Hence, if you do not want to give us your credit card information, complete the credit card authorization form, scan your passport, etc, there are some options available as followed. 2. Paypal: Pay through https://www.paypal.com/ using your credit card. We accept the payment transfer through bank accounts. We also accept payment using Western Union service through any bank in the world. We will send you details of our receipt and subsequently you will need to provide us with the control number to confirm the receipt of payment. Please be kindly noticed that transaction fee is available. + Upon the completion of visa service payment, you need to send us information of your payment receipt via email ([email protected]). Using the details you provide, we will handle all procedures related to visa. After 2-3 working days for normal service or 1 working day for urgent cases, you will receive your visa approval letter with code. 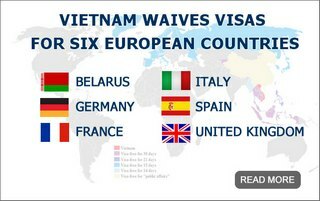 You afterward can have your visa stamped at Vietnam international airports or at the local Vietnam Embassy. + The fee paid to us is for visa processing purpose ONLY. When you get your visa stamp at the airport of arrival or local Vietnam Embassy, you need to pay for the stamping fee yourself. Please see Visa Fee for detailed tariff. Need support? Customer care advisors are standing by. Call us (+84)-9 8852 2908. You can also email to [email protected] and Our Customer Support will reply within 2 hours during office hours and within 24 hours outside of office hours.